Neil Lyndon remembers driving a very well equipped hatchback, the Kia Rio. “Now you’re just being silly,” she said. True enough. But it’s an indication of how little there is to say against this endearing subcompact five-door hatchback that we were reduced to niggling over its name. Where do I go to collect my medal for not pointing out that a week with a car is quite a long time in which to fail to notice the nameplates on the tail? And, also, that seeing as this is the fourth generation of the model to be called “Rio”, it might be a little late to be finding fault with the name? Now that Kia have been going so swankily upmarket with £40000+, Audi and BMW-rivalling models like the new 2+2 Stinger, there might have been suspicions that they are pulling up their roots and throwing them on the bonfire. The success of the Hyundai-Kia conglomerate over the last 15 years has been securely based in making sound, reliable, cheap cars that were outstanding value for money, backed up by an unrivalled seven-year warranty. In recent years, however, Kia have been following Skoda in progressively upping the stakes for the design qualities of their cars and the depth of their build quality. Along with those enhancements, inevitably, has gone an upward creep in prices. 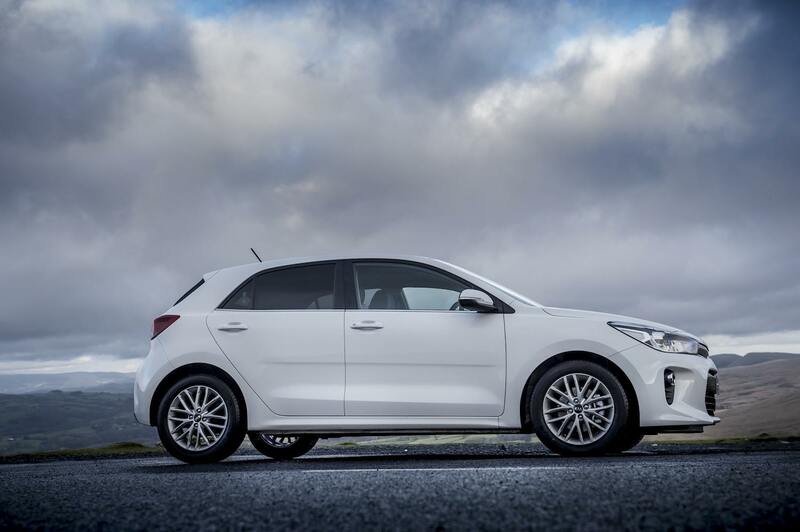 The Kia Rio 1.4 CRDi ‘3’ Eco we borrowed (to give it the full moniker which my wife will certainly fail to learn by heart) marks a solid reassertion of essential Kia values: it is, at one and the same time, both deeply excellent and profoundly average. Manufacturer’s claims about their new cars are not usually known for the modesty and restraint of their language but Kia’s most florid boasts for the looks of the new Rio are: “The styling is characterised by straight lines and smooth surfaces which emphasise the car’s greater maturity.” Seeing as exactly the same words could apply to a pane of glass or a cricket bat, it looks as if Kia might have been a bit stumped to find something exciting to say. The reason for this uncharacteristic modesty becomes clear a few lines later where they say that the styling was “a joint effort by Kia’s design teams in Germany and the United States, with the involvement of the main design office at Namyang in South Korea”. Oh, oh: this tells you everything you need to know. Instead of letting loose Peter Schreyer – Kia’s European design director and arguably the most inventive designer working for a mass manufacturer today – the suits in Seoul turned the Rio over to the drones and clones on their home turf. The result is a design that leaves, literally, not one feature lasting in your mind. I am writing this a few days after our Rio was taken away at the end of its week’s loan and I honestly can’t recall a single thing about the way it looks. That’s a Kia of the old school for you. I do, however, remember a wealth of details about the pleasurable experience of using and driving the Rio. I remember realising with delight that a host of the goodies that used to be the preserve of luxury cars have now filtered down to a standard family hatchback – such as heated seats and steering-wheel and headlights that shine their beams round corners. On the ‘3’ spec for the Rio, these extravagances are standard fittings along with 7-inch touchscreen satellite navigation with Android Auto and Apple CarPlay connectivity and Bluetooth with voice recognition. Of course, the buyer is paying for all that kit in the £17715 on-the-road price, but you wouldn’t get a Polo or a Fiesta equipped to the same level for the same money. I remember being overtaken on a country road by a nutter in an Audi RS A7 who seemed to take it as a personal offence that he was behind a Kia Rio which was making brisk progress through bends and who knocked himself out to get past only to find me unshakably on his tail for the next five miles. Much of this performance was owed to the torquey 1.4-litre diesel engine but the main factor was the Rio’s brilliant similar suspension system with independent MacPherson struts at the front and a torsion beam axle at the rear. Springs and shock absorbers have also been revised for more immediate handling responses. It may seem far-fetched to say so, but the balance of powers and driving dynamics in the Rio was only a notch or two below a hot hatch – and delivered with an absolute absence of fuss or ostentation. Most of all, I loved checking the average fuel consumption in this car. Despite my most energetic and dedicated efforts, I could barely shift it below 50 mpg. That’s a far cry from the 74.3 mpg Kia like to imagine but, even so, it’s a fantastic return considering the daft hooning the car was suffering. I may not remember what the Kia Rio looks like, but I shan’t forget it. I don’t think my wife will either.